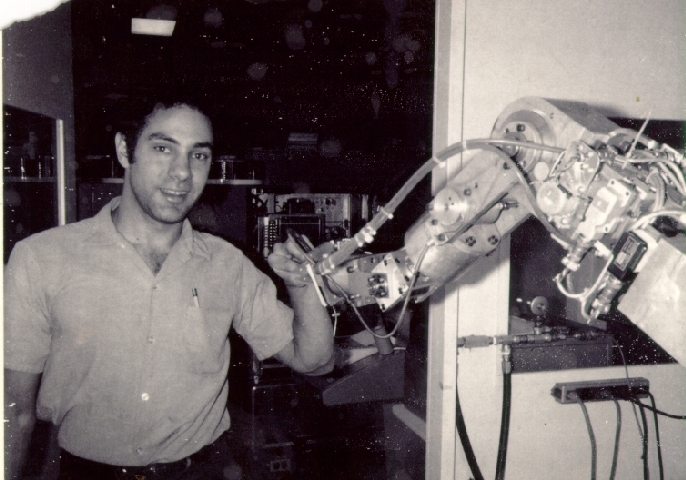 Victor Scheinman with an early robot arm at Stanford 1968. We are sad to learn that Victor Scheinman passed away on September 20, from complications of heart disease. He was 73. Victor Scheinman was the inventor of the Stanford Arm, the first all-electric 6-axis mechanical manipulator for assembly and automation that was capable of computer control. Scheinman commercialized the robot arm as the PUMA, or Progammable Universal Machine for Assembly, which is used in almost every industry application today. Scheinman developed the Stanford Arm while a mechanical engineering student at the Stanford Artificial Intelligence Lab (SAIL) in 1969. 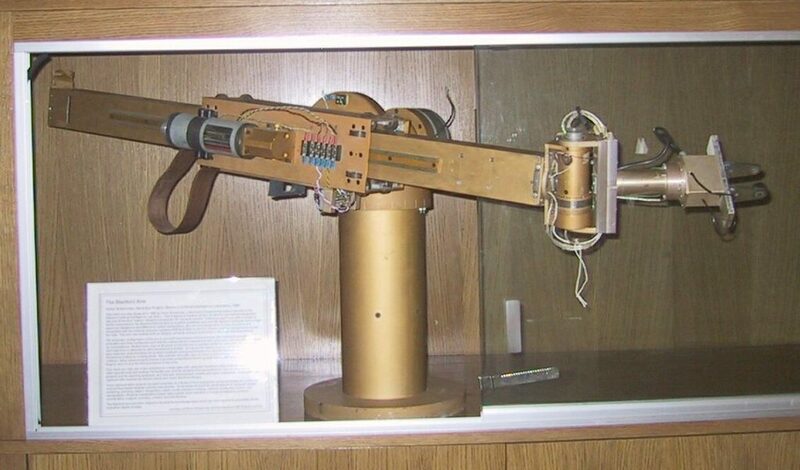 According to the Stanford Infolab, the original design is still in use today, although one of the first PUMA arms is now in the Smithsonian Museum. “The kinematic configuration of the arm is non-anthropomorphic (not humanoid) with 6 joints (5 revolute, 1 prismatic) and links configured such that the mathematical computations (arm solutions) were simplified to speed up computations. Brakes were used on all joints to hold the arm in position while the computer computed the next trajectory or attended to other time shared activities. Drives are DC electric motors, Harmonic Drive and spur gear reducers, potentiometers for position feedback, analog tachometers for velocity feedback and electromechanical brakes for locking joints. Slip clutches were also used to prevent drive damage in the event of a collision. Other enhancements include a servoed, proportional electric gripper with tactile sense contacts on the fingers, and a 6 axis force/torque sensor in the wrist. In 1973, Scheinman started Vicarm to commercialize the Stanford Arm. Vicarm sold the design to Joseph Engelberger’s Unimation in 1977 and development of the PUMA systems continued. In 1980, Scheinman left Unimation and parent company General Motors to join Automatix where he continued to create new robotics systems including the modular Robot World system that was acquired by Yaskawa. 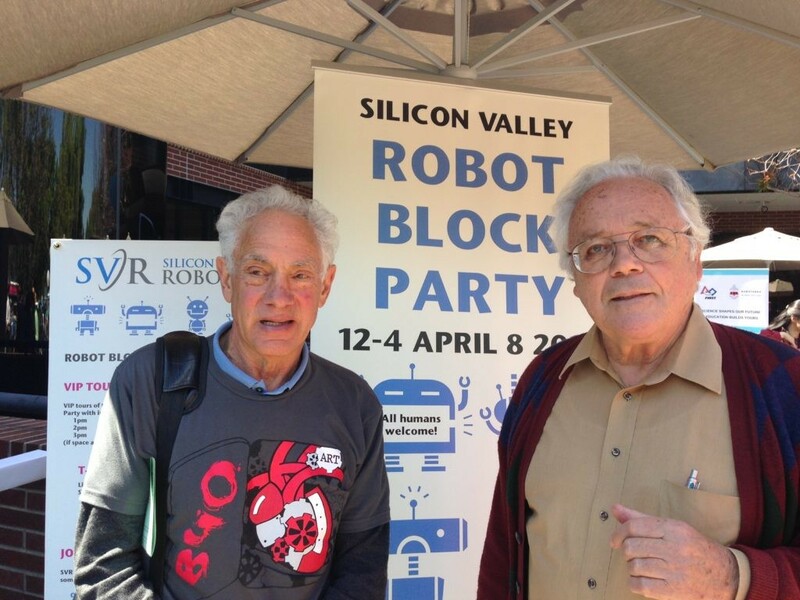 Local roboticist John Meadows, of Able Designs, worked with Vic Scheinman in the 1970s and remained in close contact, attending Silicon Valley Robotics events like the Robot Block Party together. “It has now been almost fifty years since I met Vic at Raychem and first heard his plans to start a robot company. This became known as Vicarm and I worked with him in designing the PUMA robots which were the first electric anthropomorphic arms. Vicarm became a part of Unimation after which Vic moved on to start Automatix and Robot World. Scheinman was awarded the Robotics Industries Association’s Joseph F. Engelberger Award for technology in 1986, in honor of his prestigious accomplishments. In 1990, Scheinman was given the Leonardo da Vinci award from the American Society of Mechanical Engineering, its top award in product design and invention. The Robotics History Project also has an interview with Victor Scheinman. From the obituary published in the Almanac News: Updated information on the memorial can be found and memories, photos, and thoughts can be shared on Facebook or by emailing memorial@vicarm.com.